By default, Index Manager will index accented characters, such as äöü, different from un-accented characters. However, Index Manager is able to make searches accent insensitive. This setting is set on a per-archive basis. When enabling this option, Index Manager will ignore accents when indexing and treat them as regular unaccented characters. Thus it will be possible for a French user, for example, to search both for précipité and precipite and return all hits with or without the accents. 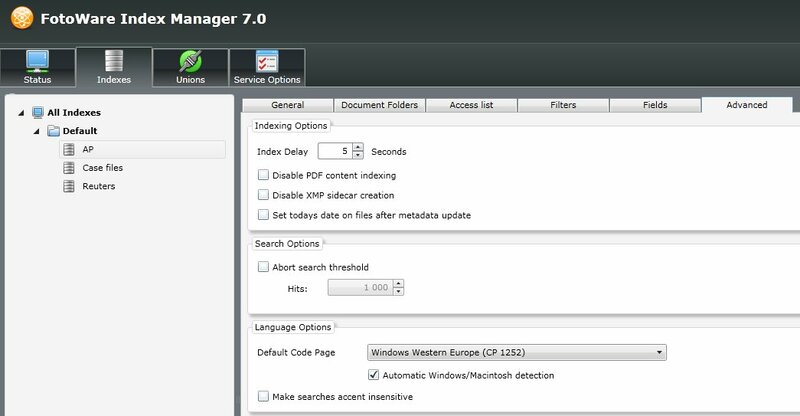 In order to enable the feature, open Index Manager’s Operations Center page, and edit the settings for the Index(es) you wish to make searches accent insensitive. Under the Advanced tab, you will find Language Options. Once you have made the changes, you must perform a complete rebuild of the Index(es) since it controls how Index Manager interprets the files’ metadata at the time when the index is built. A note to Scandinavian users: The special Scandinavian characters æ, ä, ø, ö and å are treated as accented versions of a and o. Hence, when searching in archives with Scandinavian metadata, it makes sense to retain accent sensivity (by not selecting the checkbox in question). Caveat lector: I used to work with support at FotoWare. This blog is my own space, I am not paid to write it. I write about FotoWare and FotoWare products because I believe in them.